As my friend and I drove into Centerville, I thought for a moment that we had driven through a tear in the fabric of time and space and had found ourselves on the National Road in Maryland. At first glance, Centerville reminded me a lot of Maryland’s New Market, with its row houses right on the edge of the road. Like New Market, Centerville is a major destination for antiques shoppers. 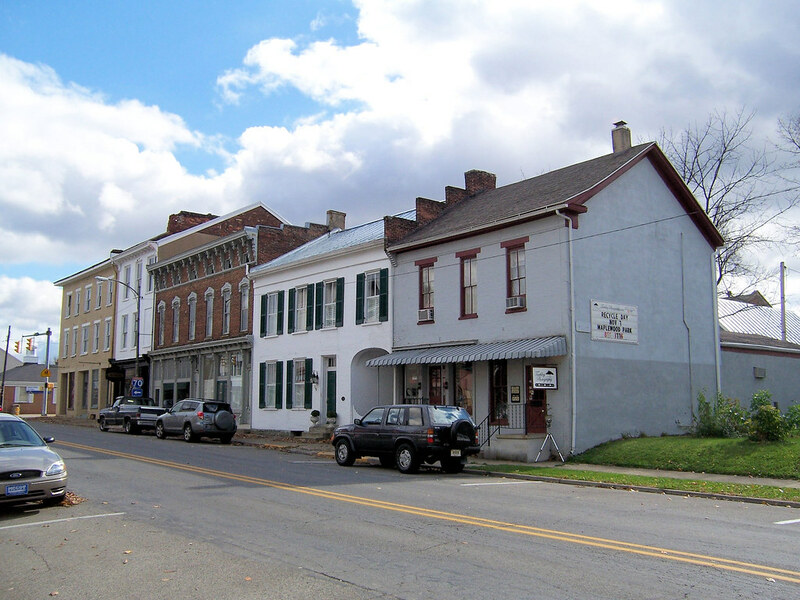 While Centerville isn’t as old as New Market (which dates to 1792), Centerville is an old town by Indiana standards, having been laid out in 1814. Quakers were first to settle here. When the National Road came in the 1830s, it was natural for it to run through Centerville. Check out more of Centerville’s history. 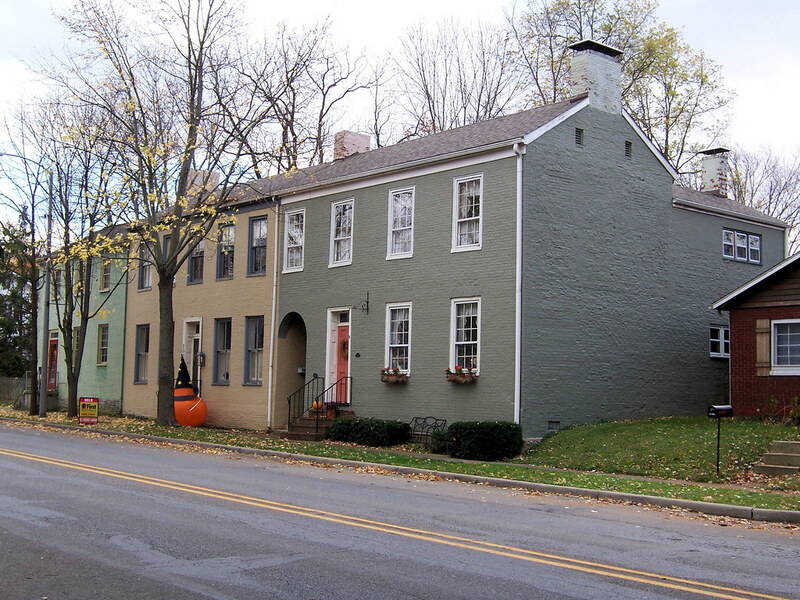 My favorite building in Centerville is the Lantz House. Wagonmaker Daniel Lantz built it in the 1820s. His home was the left half of the building; his shop, the right. Today all of it is a bed and breakfast. The current owner restored the house in the early 1990s. I really enjoyed the strength of the entry. Did you notice the arches in two of the photos above? Centerville has five such arches in the buildings that line the National Road. Originally, the road had a 100-foot right-of-way. In 1816 (or 1818; sources disagree) Centerville became the Wayne County seat. With the increased activity that brought, the right-of-way was reduced to 65 feet, and property owners added to the existing buildings along the road, bringing them right out to the road’s edge. The arches were an innovative way of providing access to the original buildings behind. 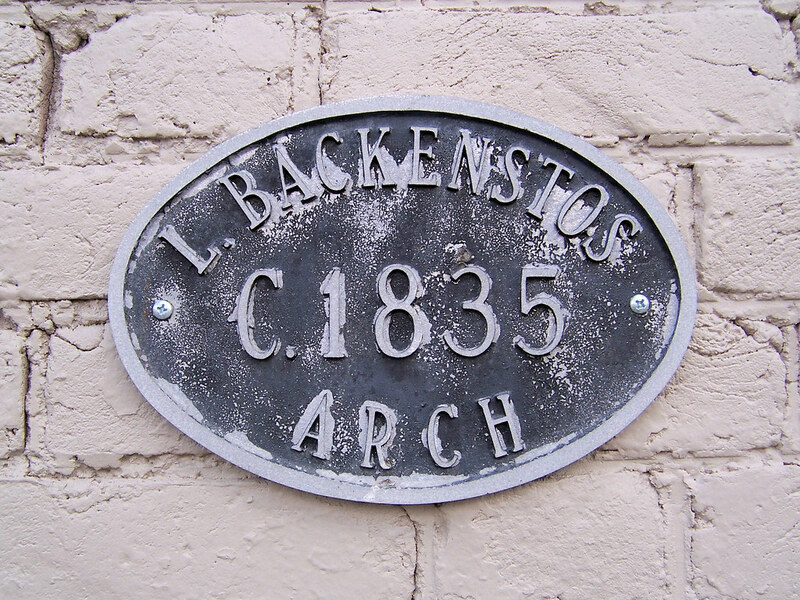 Today, each arch is marked with a plaque like this one, telling when it was built and who owned the building at the time. This plaque is attached to the building below, next to its arch. Centerville celebrates its arches each August with the Archway Days festival. Centerville wasn’t the first seat of justice in Wayne County; a town called Salisbury was. Salisbury no longer exists, but a Salisbury Road still runs north-south just west of Richmond. At any rate, this 1811 log cabin was the courthouse in Salisbury. It was reconstructed here in Centerville in either 1952 or 1998, depending on which of the two plaques you believe. 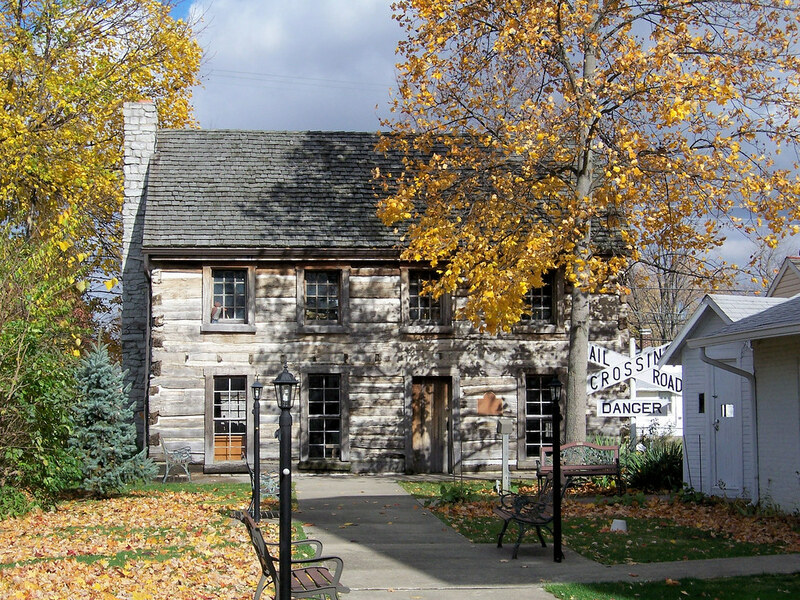 It is the only log courthouse still standing from the old Northwest Territory. Centerville isn’t the current seat of justice in Wayne County; Richmond has been since 1873. The decision to move the county seat caused an uproar in Centerville; residents fought back. It went so far that when Richmond officials came to get the county records from the courthouse (below), someone from Centerville fired a cannon loaded with scrap iron at them. The courthouse still bears punctures from the shrapnel. Read the whole story. The courthouse is now the town’s library. Centervillians had quite an ornery streak, actually. 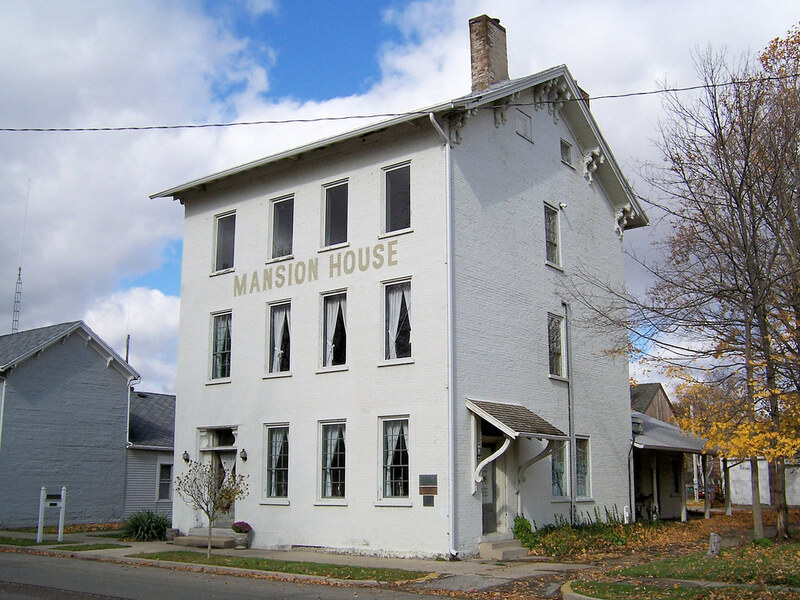 This is the Mansion House Inn, completed in 1840. It was a stop for National Road travelers and was known for the gambling that went on inside. 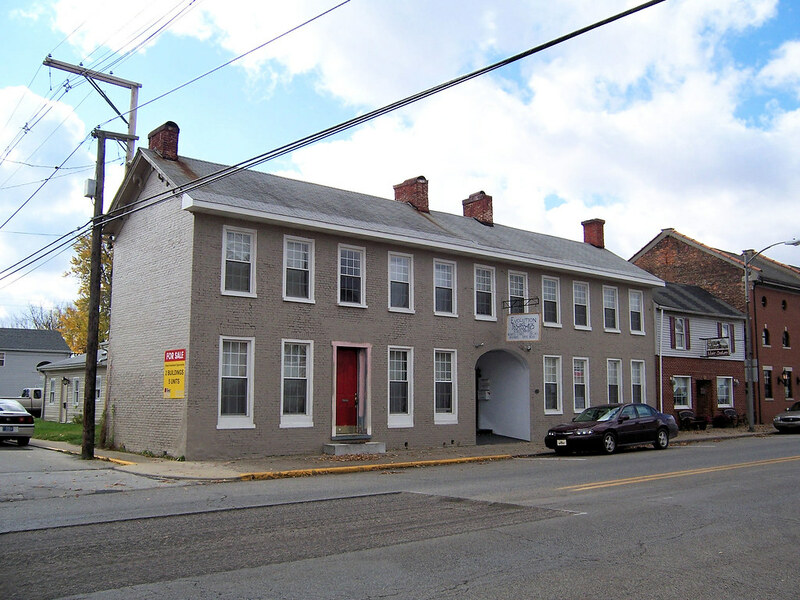 In 1858 a group of Centerville women, up in arms over such immorality in their city, axed their way through the inn’s door and destroyed the inn’s stock of whiskey barrels, letting the liquor spill into the street. A judge ordered the women to pay for the damage they caused, which came to about $3,000. That had to be an astronomical sum at the time! I stop in a lot of small Indiana towns on my road trips, but I’ve enjoyed few as much as I enjoyed Centerville. Really great pictures. I almost feel as though I have visited Centerville this morning. Thanks, Jim. I enjoyed reading your story about Centerville. It is a jewel that we treasure. Thank you for the positive comments. Just to clarify the Salisbury courthouse date discrepancy, the courthouse was moved to the Centerville High School in 1952 and later moved to its current site in 1998. Nancy, thank you for clearing up the mystery! Glad you enjoyed my post. Thanks for stopping by, Christopher!